I have been promising this for quite some time…and now here it is. 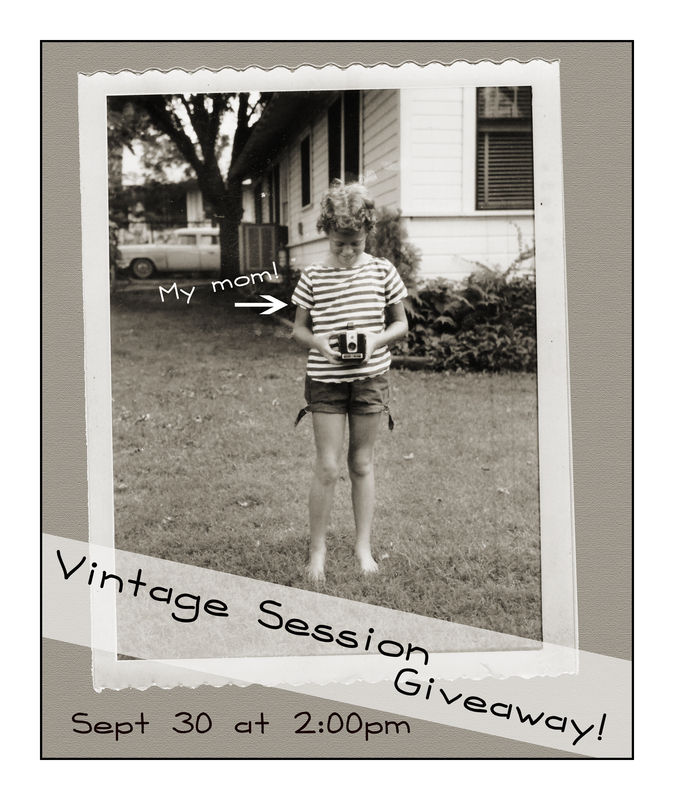 Abigail Criner Photography is doing a VINTAGE Session giveaway! What in the world is a “vintage” session? When will it take place? What do I have to do to enter? The Vintage session will not be your typical Abigail Criner Photography session. What?! I love color, I love crazy walls…You can see that in all my images. I want to do something a bit different. So, this photo session will be a completely Black and White, no color photos, with places and poses inspired by the past. The winner will receive a free vintage style photo session ($250 value), for 1-2 persons (sorry, no families), 10 really cool 4×6 prints, and a small brag book to show your coworkers! All this is worth over $300! Sound good? Want to enter? All you have to do is leave a comment on this blog post (make sure you include your contact info…NOT in the message for all to see). I will put you name in a basket. The random drawing will take place September 30th at 2:00pm. The winner will be contacted via email and given the date options to choose from. (Session will take place in Waco.) Everyone who enters will receive something….! So enter now….and tell you friends! I want to win…pick me…pick me. SO fun!! I’ll enter my name…I’d love to do one with my sister, we don’t have any recent pictures together! How exciting! I’m way overdue for some great photos of my kids. Even if I don’t win I hope to use you sometime.! Okay, so I have been checking back to see what this is all about….and it is here!! Here is my entering comment!! Oh i think me and Sarah need a vintage sister session. What a fun idea! Your SO creative! That is such a cool idea, you are going to get some fabulous photos! Abby! How cool. I was just thinking this morning about how I need to try to reschedule with you – I want to do pics of Maddie for the family as Christmas presents. I’ll get with you soon about a date. This idea is the coolest! Hey Abby! Count us in! This is such a fun idea! We love ya! Abby!! I LOVE vintage… and I cannot wait to see the products of this shoot be it for me or for someone else. 🙂 Great idea! ohhhh… exciting! I can’t wait to see who wins and how their pics turn out! Hmmm….Alan and I could use another photo session. And how cool would it be for it to be vintage!?!? I entered down below… so here I go again. This sounds so fun and I would love to do this before Chris and I left! I will also tell some friends as well. Count me in! Even though I already have your work all over our home! I mean seriously… who wouldn’t want a free session with you? Oh, I forgot to add…. PLEASE? WOW, what a fun treat! I would love to have some fun pics of our growing baby. Hi, Abby…I’m entering my good friend, Courtney Buck. She has two of the MOST adorable boys!! They would be perfect subjects for vintage shots! I am entering myself! 🙂 Sounds like a neat idea! I hope I hope I hope I get my name drawn out of the hat! Your work is amazing! Blessings! Soooo… my birthday is the 29th. That’d be a pretty cool b-day present. I’m just sayin’ – I think fate is on my side with this one! Oh yeah, I want to be part of the contest! I love your work. You have such an amazing gift! I absolutely love your pics and show all my friends on some of our breaks when we need a pep me up! You do a fantastic job! Oh yeah and I so want to win along with everyone else! I love your photos, I want to win! ooh, competition is heating up. glad I stumbled upon your work! I have been admiring your work from afar…but I know if I won…it would more than worth the drive! Oh, my email is jessicamatsler@gmail.com! I want to enter the competition. It would so cool and it sounds like fun! My phone number is 903-466-5881. My email address is katboose13@yahoo.com. We’d love to win a photo session! A friend told us about you… great shots! I’m definitely in this drawing…facebook is a good contact for me. Abby #2 or was it #1…I forget! Pick me! David and I would love to enter! 713.906.9499! What a great idea! i’ve got my fingers crossed. we’ve really needed these. My two daughters look vintage…does that help? pick me! pick me! if you enter more than one comment do your chances to win increase? Katy Blackshear would like to enter. All I can say is just WOW! I contacted you to see if you could shoot my wedding in October- but alas you will be out of town… I am so very impressed with your incredible artistic eye, and sense of capturing just the right photo. I would love to have a portrait session! Your talent is such a great blessing- use everything you have! I would really like to do this as, my fiance and i have been together for 10 years, and been through so much together. I am a cancer survivor times two- he was there the whole time- a photo session would be so great to capture the fun and laughter, and fun we have had over the last years together. I like vintage photos. So does my wife. Pick me. I love your photos you really capture something special. I’m entering. I love your work. This sounds amazing! Definitely enter me! My best friend would die to have vintage photos. Even her upcoming wedding is vintage. Enter me for her. Please Pick me! This would be an amazing experience. I just love your photos and wish I would have came accross you when we did our wedding. So much fun, and I would love to see what you did with a vintage inspired set. This is so cool! Enter me please! Awesome!!! This is a very creative and great idea. I would love to win this session with you. You are such a talented artist…. I’m in it to win it. For Emi. Oooh! Oooh! Pick me! Pick me! This sounds great. i’d be nice to have some pictures with my wife. thanks for doing this. love you pics! sorry, my comment was supposed to say “love your pics!” I really ought to proofread. Lylah told me she wants you to do some pictures of her…so I told her I would enter this! Pick us Pick us!!! ps: your so fun to do this! You did a beautiful job on Marty (my son) & Stef’s engagement and bridal! I’d love to have some of my husband and I. Vintage would be great for us “boomers”! I’d love to enter! (Misty Holman) I love your work. This sounds fun! We’d love to hang out with you! You know I LOVE your work. Walker and I need to take some pictures together!! This could work for some of mine and Nick’s engagements. Pick me!!! good lord a ton of people entered.